On the trail again... just can't wait to get back on the trail again. The Burnt Helmets are off to OCup #3 this weekend at Hardwood Hills. Weather is looking good for the race - we're racing at 8:30 and 9:30am on Sunday. I am trying out some new tires this weekend - Maxxis Aspen's. I've used the Maxxis Monorails for a few years now, and I thought I'd try some new tires out. 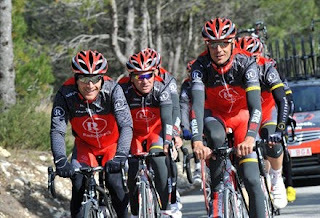 Race report coming on Sunday (or Monday). While normally you forecast the rain on race day Sunday you seem to be absent from your post. Looks like its going to be sunny and so on behalf of the BH team I will forecast the MOON! to you! How do you like them apples! The BH team requested the pine pavillion and we got it. Site 196 is nice and quiet, has access to power and should be dry if it rains. So here is my account of this past weekend's Ontario Cup moutain bike race. This was #2 of the series, held at Albion Hills. We usually drive down to the races on Saturday to pre-ride the course. We woke up Saturday morning to a snow storm in North Bay - on May 8th. There turned out to be a record snow fall that day of 9.2cm apparently. 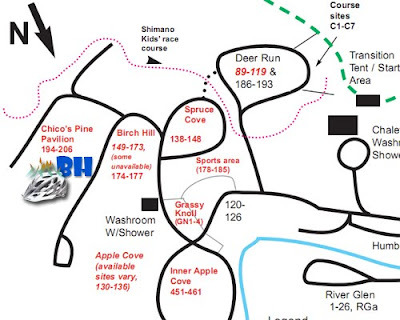 I checked the race website in the morning while I was packing the truck, and Chico said preriding was closed till 2pm as they were fixing up the course after the deluge of rain they have had. So we decided to not leave so early as there was no point in preriding. We've raced there many times, so the course would not be much of a surprise. We got rolling down the highway about 11am; I had to put the truck in 4 wheel drive for the first 60 or so km down the highway for safety. The bikes on the rack where getting a good coating of snow and ice on them. We stopped at Albion Hills to register - no snow here, but we could see that it had rained alot. We registered for Sunday's race and then headed to our hotel and then to go get some dinner. Sunday morning we awoke to some chilly temps - I think it was -2c. I was kinda happy about this cause it meant there would be no blackflies to bug Jenn. Deny and I watched Scott's race at 8:30, and Amy's race at 9:30.. shortly after Amy was done I looked at my watch - 11am! dammit, I wasnt leaving myself much time to get ready and warmed up for my 11:30 race start. I rushed to the truck to get dressed and get my bike ready. When I was done, I had about 8 minutes to warmup and get to the start line - definately not enough time for a warmup - I did a couple sprints up a hill by the truck and headed to the startline. I had enough time to get there and in the start pen, as I was in the 4th group to leave I think. The start gun goes off and I hold my line to get to make sure I got the best line up the hill. Everyone quickly files into their 'spots' and and we formed a paceline up the hill and towards the singletrack. By the time we got to the singletrack, I was near the end of the pack, which is what I expected for my fitness level (this was only my 5th time on the bike this year really). I then set about trying to get warmed up but for the first 3/4 of the lap all I could think about was quitting. I was not having fun at all. Near the end of the 1st lap I started feeling alot better; I think I almost smiled, and decided not to quit. 2nd lap goes alot better - I am able to knock over 3 minutes off my first lap time. I start catching guys, whom I can only think were in my category. The expert ladies are catching me now and I ride with one for most of the rest of the race. 3rd lap goes even better and I knock another 30 seconds off my 2nd lap time. I am climbing the hills now in a larger gear and passing a few people. Near the end of the lap I see 3 guys just about to crest the top of one of the larger hills, as I am hitting the bottom of the climb. I stand up and use whatever power I have left to try close the gap on them as it was the best return on effort for me. My legs were not happy, but I am able to pass one guy before the next singletrack and I catch and pass the next 2 guys shortly after. I don't know if they were in my category or not, but they were my targets regardless. I soon see the 1km to go sign and I start giving all I have left and I see one more rider ahead of me. I pass him on the grass just before the finish line. Thankfully Amy was cheering me on and told me to go to the right - to the finish line, as I had my head down and was headed to the lap line - that would of been embarassing! So its three weeks till the next race, at Hardwood Hills. I will try to get some structured training in before then, I know it can only help. I have a powertap on my road bike and I plan on putting that to use, as its worked for me before. I will also make a point of getting a really good warm up before that race, as Hardwood can be a little tougher for me with its short punchy climbs. WTF (What the forecast). No Seriously WTF!!!! There seems to be a reoccurring weather theme with Sunday Race day. 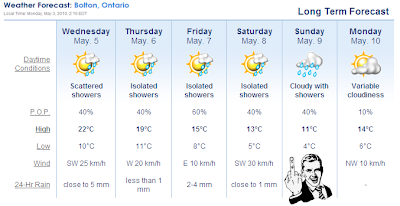 Now if you recall 2 weeks ago I displayed an image of the forecast for Ocup #1 and our friendly weather man holding up his finger either to point out the rain in the sky or to suggest some other meaning. He's doing it again this week, Sunday, for the Albion Ocup # 2 near Bolton. I won't knock on wood because I'm not a superstitious dude (besides all there is around me is plastic) but hopefully the weather man is just joshing us like he did last race since there wasn't a drip of rain for Ocup 1. I didn't even sweat. I'm not complaining but instead of washing my bike off because of mud, I was blowing it off with compressed air form all the dust. No complains... Albion will be so fun if its dry.